Many of the special events of my life have been held at the Johnson City Country Club. The 100th year of our grand lady is being celebrated this year. I attribute my love of classic architecture and French influences to my early visits when I was only a teenager. The entry hall leading to the ballroom has always been so warm and welcoming. 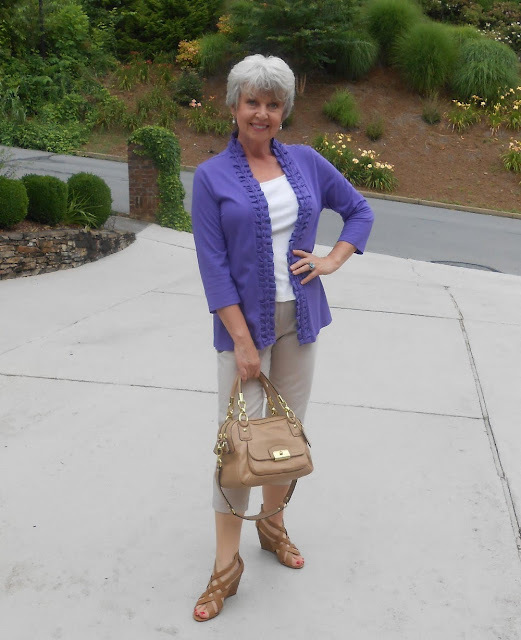 The outfit for date night dinner with great friends includes a necklace, tank, ankle pants and a light weight cardigan from Chico's. The shoes are old from Nine West. The bag and sunglasses are from Stein Mart. Today we had the nicest weather of the summer! Earlier in the day we attended a Bristol Race Day brunch at the lake home of our dear friends. It was great fun to see a few of my sweet girlfriends again and just be silly. Some of us are trying not to fall off the steps while Mr. Mickey is snapping pictures before we are ready. The view from my back deck was especially beautiful on this sunny day! Before dinner, Mr. Mickey took me to Chico's since we had a few minutes to spare. Isn't he the best?! Even happier coming out the door! With the sale they were having and my birthday Passport discount added on it was like getting a tank top for free! Tank tops, or any other basic that you wear as often as I do mine, need to be updated at least once a year. The tanks at Chico's are top quality and I love it that the necklines are not too low. I buy a size too large because I don't like them to cling to my middle so much. Wellington's is a fine dining restaurant which is part of the Carnegie Hotel and Spa in Johnson City, TN. We visit this restaurant often, but on this evening we had the best meal in years! The fried green tomatoes with pimento cheese and orange marmalade appetizer was one of the best things I have ever eaten. They also had our all time favorite wild mushroom soup. We are two happy people! There was a splendid live Jazz performance in the lounge on this evening but we could hear the performance from our table as well. Local readers may recognize a special ETSU professor back there in the center. We enjoyed sitting in the lounge listening to them after dinner. Mr. Mickey snapped this photo as I walked away from the tip jar. He is my own personal Paparazzi! Both my outfits for this day are from Chico's. I have been asked to be a style ambassador for them, however that would require additional trips to Asheville for shows or seminars. At this time my plate is much too full to add anything else so I will consider it again in the future. For now I am just a very happy loyal Chico's shopper! I hope that your day was also filled with sunshine and cooling breezes. Kathleen Mannix is one of many extremely talented designers who create amazing works of art using items from my company. She recently sent me one of her beautiful creations as a gift! I had so much fun styling an outfit for date night to showcase this gorgeous necklace. The fabulous necklace is a one of a kind sculptural piece which incorporates vintage items and components from my company including the stunning Swarovski pendant. To see more of the work of this acclaimed artist visit her web site at Nouvique. When I wear a glamorous statement necklace such as this one, I let it take the spotlight by keeping all the other elements of my look very sleek and neutral. The tank, pants and jacket are all Travelers from Chico's. The clutch bag is from Stein Mart. The shoes are from Macy's. Mr. Mickey and I often turn dinner reservations in a nearby town into a day trip full of other activities. Saturday was one of those days. I dressed for a warm day in the city followed by dinner at a restaurant we haven't visited before. We spent part of the afternoon in Asheville sipping a beverage at a sidewalk cafe watching the local characters. This is one of our favorite street performers. He plays, sings and dances all at the same time. Sister Bad Habit is always a fun one to see zipping about. These performers made their own instruments to create their haunting melodies. We bought one of their CDs they were so good! We shopped in the Grove Arcade which has an amazing entrance. Gargoyles are a recurring theme throughout Asheville. The flowers on many of the streets were amazing! This is an apartment building across the street from The Grove Arcade. As twilight approached it was time to take the short drive from Asheville back to Weaverville for our dinner reservations at the Glass Onion. We tried several different items from the menu and each was a great delight to the eyes and the palate. We shared a delightful dessert of a profiterole filled with lemon cream and topped with blueberry reduction. It was so very good! The husband and wife (this is Natalie with me) owners have always been head chefs at fine restaurants in New York until they decided to take the plunge and open their own restaurant here in the mountains of western North Carolina. We are so fortunate that they did! We loved the casual elegance, wonderful food, attentive service (but not too much) and visiting with the other diners around our table. It was a lovely and entertaining evening centered around exceptional food. 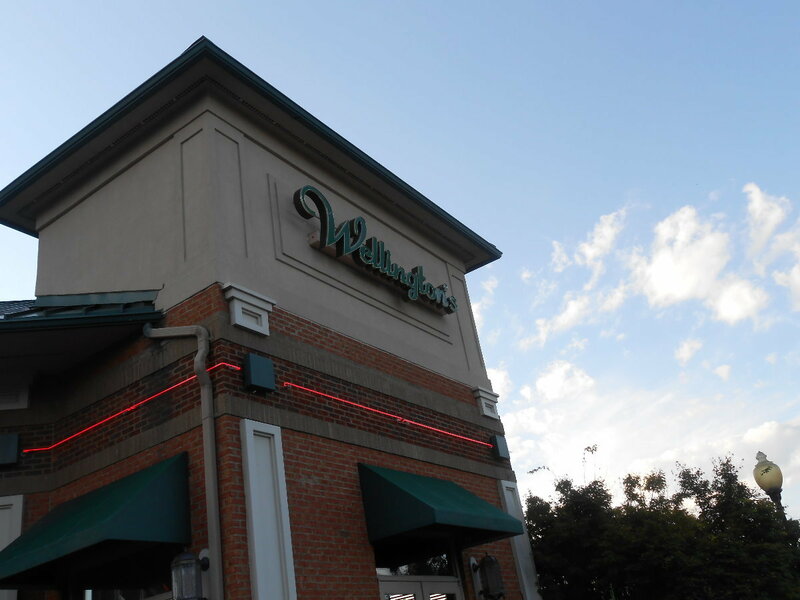 We look forward to returning very soon to try some of the other entrees. The white ankle pants are by Jones of New York. 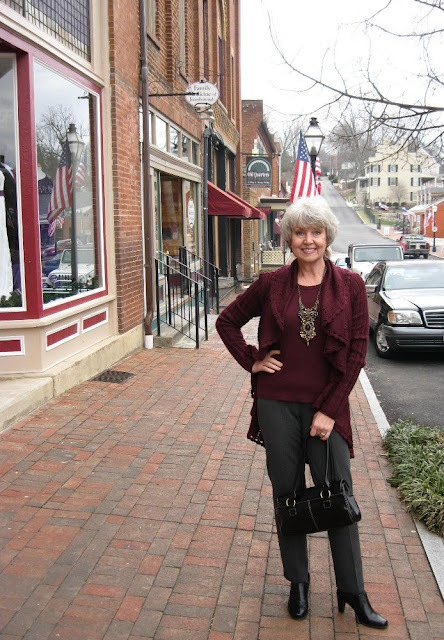 The tank, cardigan sweater and necklace are from Chico's. The bag is from Stein Mart. The sandals are by Bjorndal from Rack Room Shoes. As our weather becomes cooler each morning, I find myself often reaching for a sweater and jeans on casual days. This timeless combination can easily become frumpy if we aren't careful. I try to remember these tips whenever I wear or buy a sweater. Color: The color should be flattering to your face and it should look nice with jeans or khaki pants. Fabrication: The knit should be so fine that you can ball it up in your hands. No big cable knits or ski sweaters unless you want to add bulk to your upper half. (Not I!) Many acrylics and other man-made fabrics pill and add too much bulk. Look for cotton, cashmere or other fine gauge knits. 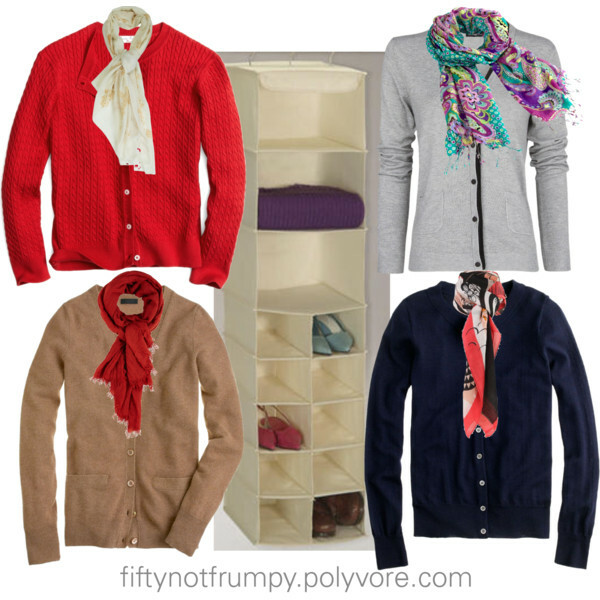 Buttons: I like a cardigan style sweater that has a V-neck. I only button a couple of buttons at the center if at all. I also look for a style that falls straight rather than gathered or banded at the bottom and I normally push the sleeves up. Crews and Vs: A pullover type sweater can also be a great addition to your wardrobe. You can wear them with a scarf, a vest or a jacket. I look for a neckline that falls below my collarbone in a fine gauge knit that does not add bulk, fits loosely and ends at the top of my hip rather than below my bottom. 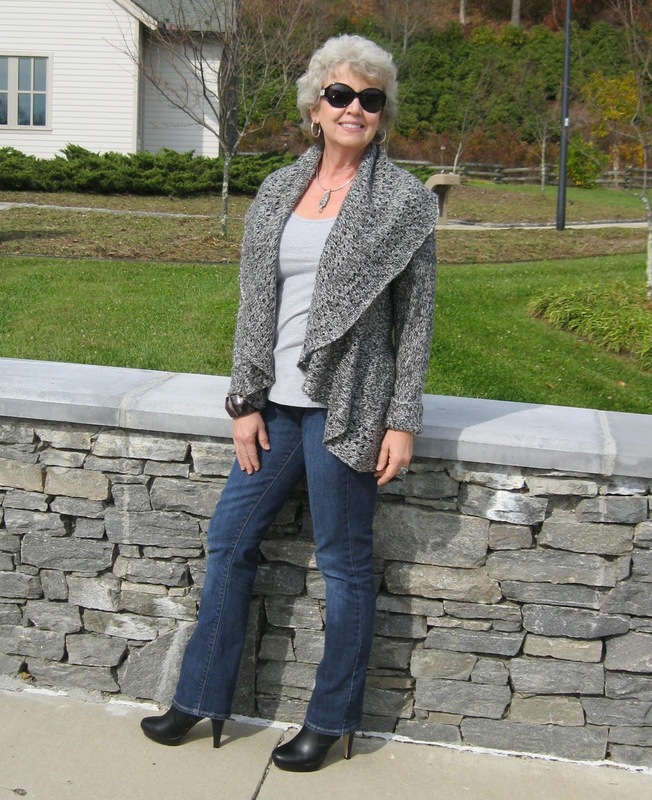 If a longer sweater is worn with loose fitting jeans the look is too bulky (think frumpy). 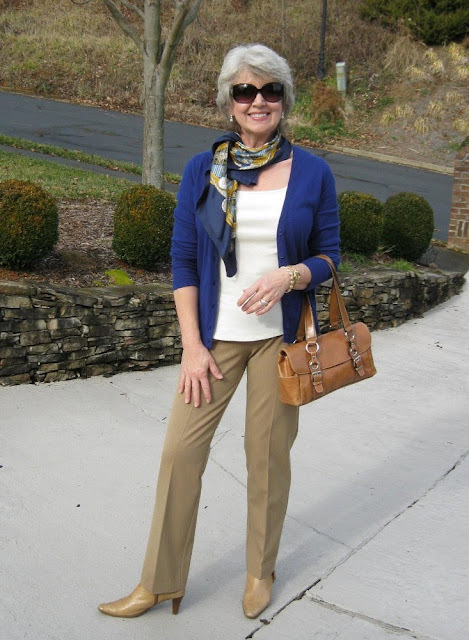 Layering: In warmer weather I wear sweaters with a tank top and an interesting necklace or light weight scarf. In cooler weather I layer them with a thin long sleeve tee and a long scarf for contrast and added warmth. Storage: Fine knit sweaters can easily be stretched out of shape if you hang them on a hanger. It might be a good idea to invest in one of the storage solutions shown above which can be purchased at Bed Bath & Beyond. These units can be added to the bar in a closet where there is room for them. A top shelf in your closet or a bookshelf nearby might be another solution for storage. You can of course store sweaters in a deep drawer in your dresser. Add sunglasses, a nice bag and comfortable walking shoes along with a favorite pair of jeans and I am ready to spend a Saturday looking through antique stores, having brunch at a sidewalk café, browsing through an old bookstore or a stroll through the park checking out an art show. Black and white with a pop of red continues to be a favorite combination. The statement necklace is enough all on its own so my earrings and ring are small. Turning up your collar and wearing three quarter or turned up sleeves helps to make you look taller and more slim. I always wear a platform or higher block heel shoe with cropped or ankle pants to make my legs look longer than they are. The light weight jacket and tank are from Chico's. The pants are from Coldwater Creek last year. The necklace was a gift from Mr. Mickey. The shoes are BCBGeneration from last year. The clutch is Kenneth Cole Reaction via T.J.Maxx from last year. Thanks for visiting my blog today. I hope you have a lovely weekend! A longer light weight sweater over a tank and slim fitting pants is one of my favorite combinations for an outfit. Add an interesting long necklace and I'm ready for a dinner date with dear friends. The pants, sweater and necklace are from Chico's. The sweater is now on sale at Chico's. The tank is from Stein Mart but I love the way Chico's tanks fit and also how they look after you wash them a few times so I have become a loyal fan. You will see lots more tanks from Chico's here! The clutch is old from T.J.Maxx. The shoes are old from Kohl's. I hope your day is filled with great things! The town of Weaverville, North Carolina is just a short pleasant drive across the mountains from Johnson City. Mr. Mickey and I especially enjoy the Stoney Knob Cafe, one of several really good restaurants there. 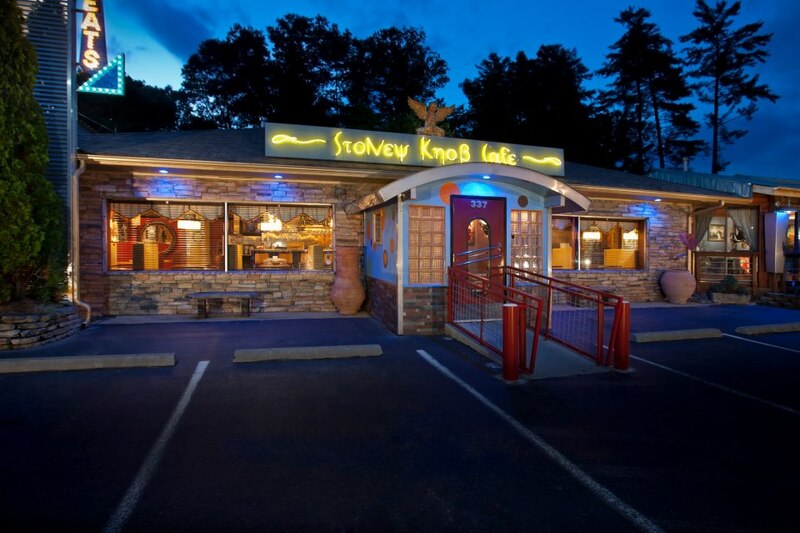 They offer a menu of American, Greek and European cuisine. They serve the most awesome focaccia bread and olive oil dip before dinner. Supreme olive oil is poured over fresh herbs, sun-dried tomatoes and feta. We could make a meal from just that and a glass of wine. It really is over the top good! I haven't worn these Vince Camuto shoes very much this year so I wanted to style an outfit around them for our Saturday date night before summer slips away from us. Weaverville is a surprising little town with sidewalk cafes, art galleries, gift shops, excellent pottery galleries and the Well-Bred Bakery & Cafe where we stopped in to pick up a fresh baked loaf of wheat bread. We have already picked out the next restaurant we will visit in Weaverville. We have heard really good things about The Glass Onion and their menu looked really interesting. 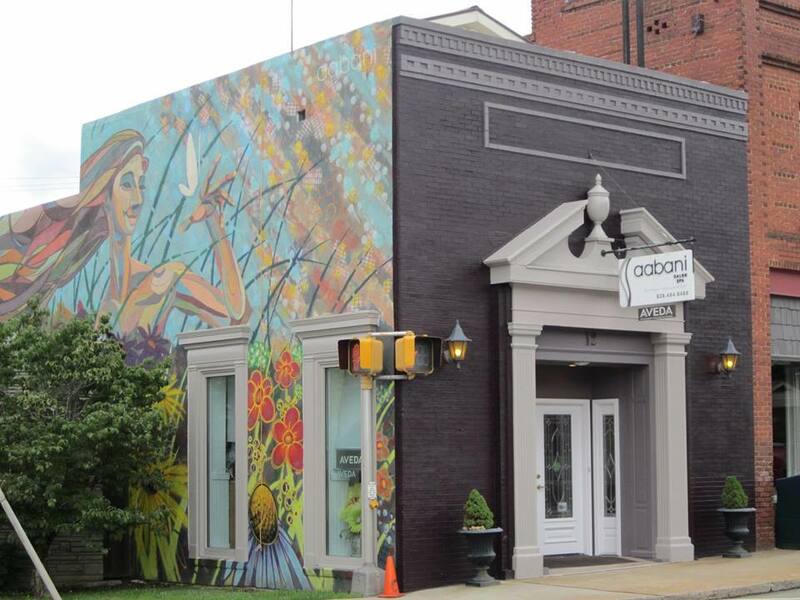 Voted one of the top 200 Salons in America, Aabani Salon is also located here in Weaverville. There was still plenty of time after our meal to take the ten minute drive into downtown Asheville. We had an after dinner Scotch and water at a side walk cafe where we sat for more than an hour watching all the people passing by. We also really enjoyed visiting with two lovely women sitting at the table next to us. We make new friends wherever we go! The light weight jacket and matching tank are both from Chico's. 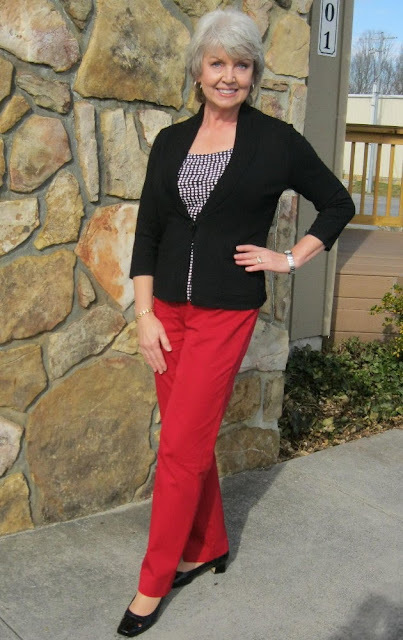 The side zip ankle pants are from Talbots. The clutch and Oscar de la Renta sunglasses are from Stein Mart. The awesome coral cuff was a gift from my sweet friend Lois. Thank you for reading! I hope your day is going well. Our evening temperatures are now dipping into the low sixties, so I am starting to see women wearing jackets and sweaters when I run early morning errands. I love the look of light weight layers whenever possible. Summer clearance racks are a great place to find those feather weight sweaters that can be worn almost all year round. Add cute shoes, a scarf or long pendant necklace, sunglasses and a nice bag to look great for any errand even if you start out with a tank top and jeans or khaki pants. This week I had the last of my summer Doctor appointments. I get all the tests we should have done at this stage of life in July because any other time of the year I am too busy to sit still that long. As I was waiting my turn in each office, I kept looking up to see women studying me. 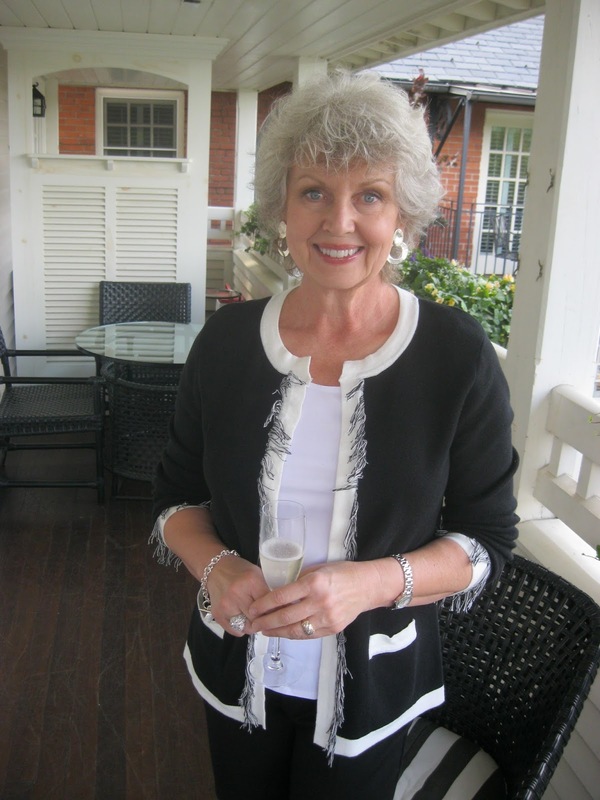 I noticed that almost all the women I saw in the near sixty age group wore a "uniform" of Mom-jeans, a dull colored tee shirt and shoe muffins (tennis shoes). I was wearing the first outfit idea above yesterday. I will be turning 57 next month but I refuse to ever wear the "uniform"! Thank you for reading! I hope you have a wonderful day.